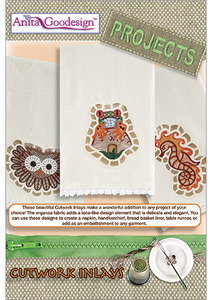 These beautiful Cutwork Inlays make a wonderful addition to any project of your choice! The organza fabric adds a lace-like design element that is delicate and elegant. You can use these designs to create a napkin, handkerchief, breadbasket liner, table runner, or add as an embellishment to any garment.